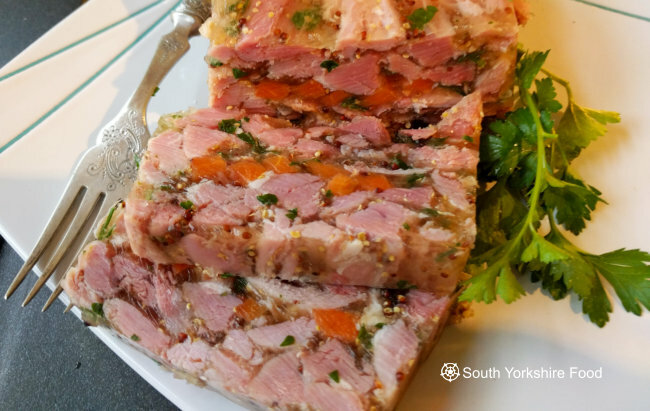 Ham hocks are an inexpensive cut of meat and can be used to make this delicious terrine. Great for a simple lunch or as a starter for a meal, served with mustard pickle and toasted bread. Put the ham hocks in a large pan with the stock ingredients. Cover with cider and cold water and bring to the boil. Reduce heat to a simmer, cook for 2½ hours or until the meat falls from the bone. Leave to cool in the pan. Grease a 1-litre terrine mould or loaf tin with the oil, then line with cling film. Remove the hocks from the pan, then strain the stock through a fine sieve into a pan. Reserve the carrot. Set aside. Shred the ham, leaving some large chunks, removing as much fat and sinew as possible. In a large bowl, mix the ham with the mustard and parsley. Cut the cooked carrot into long strips. Press the half the mixture into the prepared terrine. Make a layer of carrot strips then press in the remaining mixture. Bring the reserved stock back to a rapid boil and reduce by half. You should have about 500ml of liquid remaining. Remove from the heat. Meanwhile, soak the gelatine in cold water for 5 mins to soften. Remove from the water, then squeeze out any excess liquid. Add the gelatine to the hot stock and stir well. Pour enough of the stock over the ham to just cover. Tap terrine firmly on a hard surface to knock out air pockets, then cover with cling film. Chill for 3-4 hrs or overnight. To serve, remove from the mould and carve into chunky slices. Serve with mustard pickle and toasted bread.